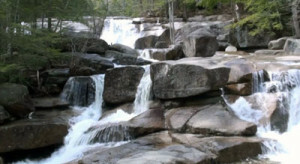 Looking for healthy, inexpensive outdoor fun near North Conway, NH? Consider an adventure on one of the following short hikes in the area! Hiking is a great way to get some exercise, see wonderful scenery, and make lifetime memories. Here are some great local hikes that offer scenic views and fun for all ages. Diana’s Baths is located off West Side Road, ½ mile north of Cathedral Ledge Road. One of the most scenic spots in the White Mountain National Forest, Diana’s Baths is a series of cascading waterfalls on Lucy Brook. The water levels vary from raging torrents in the spring to pools suitable for wading when the water is low. There is a smooth trail leading up to the pools and waterfalls. Pets are welcome but must be on a leash. Parking is available at the trailhead, and a National Forest recreation pass is required ($3 fee, available at a kiosk in the parking lot). Diana’s Baths was originally the site of a water-powered sawmill, built in the 1860’s by George Lucy. Local legend has it that a visitor to the area in the 1800’s named the spot in honor of the Roman goddess of nature. The Sokokis Indian tribe called the baths the “home of the water fairies”, and a Native American legend holds that evil spirits inhabited the baths until a friendly mountain god washed away the spirits in a massive flood. 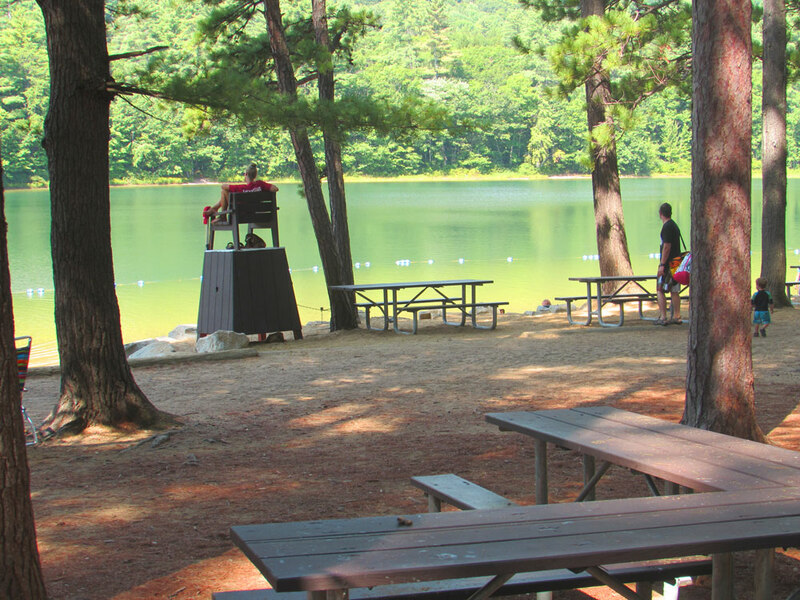 Just down the road from Diana’s Baths, you will find Echo Lake State Park. There is a one-mile trail around this beautiful lake, offering views of Cathedral Ledge. This trail is relatively flat, so if you’re looking to avoid steep hills, this is a great place to hike! 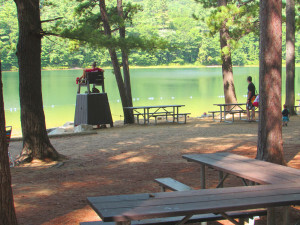 Echo Lake is a NH State Park, and is open from 9 a.m. to 6 p.m., with the park gates closing at 8 p.m. The park opens on weekends beginning on Memorial Day, and is open daily from mid-June until Labor Day. 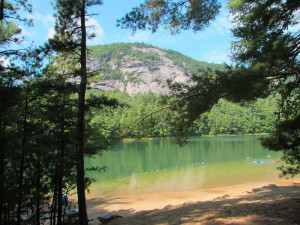 Echo Lake is favorite place for families to swim and picnic. Admission is $4 per adults and $2 for children from 6-11. The park is free for guests 65 and over. Pets are prohibited from Echo Lake State Park. Cathedral Ledge and White Horse Ledge are two well-known rock-climbing spots, and there are several hiking options here as well. One way to access these two ledges is via the Bryce Path, which splits off from the Echo Lake trail. The top of Cathedral Ledge is 1.2 miles from the beginning of Bryce Path, and White Horse Ledge trail forms a 4.2 mile loop from the Bryce Path. 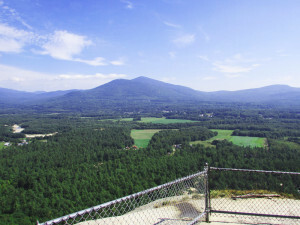 The view from the top of Cathedral Ledge is one of the most iconic in the Mt. Washington Valley, and should part of any visitor’s trip. For those wishing to avoid the climb up from Echo Lake, the Cathedral Ledge Road offers a nice alternative. This road begins on West Side Road, and climbs gradually for about a mile. 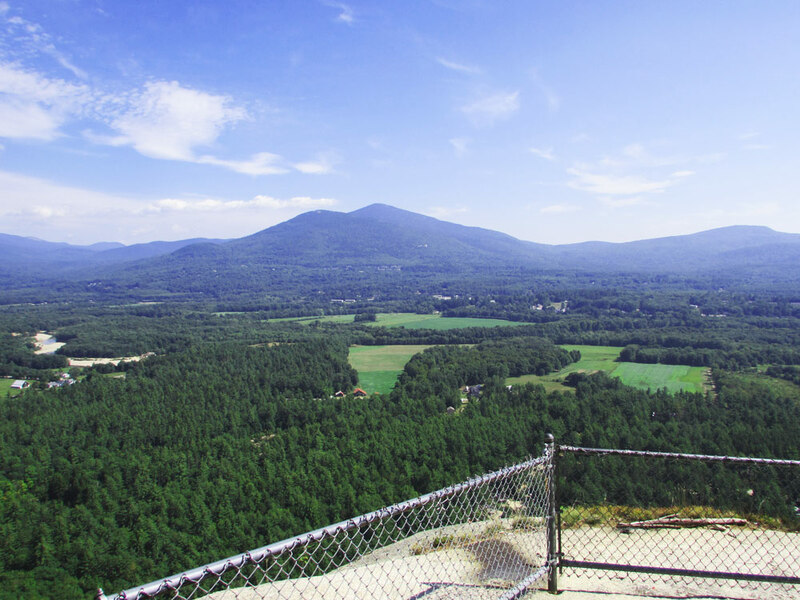 A short walk then brings you to the top of Cathedral Ledge, where a chain link fence surrounds the top of the granite cliff. It is common to see rock climbers ascending the ledge, and they usually have great stories to tell about their climb from the bottom. Hiking downhill from Cathedral Ledge along the Bryce Path leads to the White Horse Ledge trail and more fantastic views. The Boulder Loop trail is a 3.1 mile loop on the east side of the Kancamagus Highway, 6 miles from Conway. The trailhead is opposite the parking area for the Albany Covered Bridge, which goes over the mighty Swift River (this beautiful covered bridge is a great photo spot!). The parking area requires a $3 National Forest recreation pass. The Boulder Loop trail ascends 950 feet of elevation to a scenic overlook, with great views of the river and surrounding mountains. As the name implies, there are lots of large boulders on this trail, and children will enjoy scrambling among them. Black Cap, located off of Hurricane Mountain Road in Conway, offers great views of the Mt. Washington Valley, and is a nice easy hike. To get there, follow Hurricane Mountain Road 3.8 miles off of NH Route 16. This is a steep drive that will get your attention. The hike starts out following the Red Tail mountain biking trail, and then splits off to the rocky summit of Black Cap Mountain. Mountain bikes are not allowed in the summit area. The Black Cap trail is approximately two miles round trip, and is a very easy hike with little elevation gain, as the elevation gain happens while driving up Hurricane Mountain Road. The views are fantastic, and the summit is a great place to have a picnic lunch. Come and visit the North Conway area and go for a hike today. The memories from any of these hikes will last a lifetime!